First came the 4K TVs, now come the 4K streaming boxes. Roku and Amazon both launched 4K media streamers last year, letting users watch higher-resolution video without having to rely on the often-clunky interface of a smart TV. But aside from their ability to play Ultra HD content, the Roku 4 and second-gen Amazon Fire TV have little in common. Their prices are different ($100 for the new Fire TV, $130 for the Roku 4), they come in different shapes and sizes, they have varying levels of 4K app support, and their interfaces couldn’t be philosophically further apart. Fortunately, those differences should help make the buying decision a bit easier. Read on for our guide to choosing the right 4K media streamer. The 4K standard for televisions, also known as Ultra HD, refers to a picture with 3840-by-2160 resolution (2160p for short). Compared to a 1080p HD set, 4K packs in four times as many pixels, allowing for sharper details. While most cable and satellite providers are still hashing out their 4K plans, a handful of online services such as Netflix and Amazon have already started streaming some videos in the higher-res format. But 4K streaming on the Fire TV and Roku 4 brings some new requirements. You’ll need a 4K TV, of course, and it must have at least one HDMI input that supports the HDCP 2.2 copy-protection standard. This rules out a few of the earliest 4K sets, and some newer TVs may only have one or two HDMI/HDCP 2.2 ports. And if you intend to stream Ultra HD over the Internet, you'll need a faster Internet connection of around 15- to 25 Mbps, where full HD needs only 5- to 10Mbps. Assuming you’re 4K-ready, does the higher resolution make much of a difference? Not exactly. For this review, I spent a lot of time flipping back and forth between 2160p and 1080p videos on my 70-inch Vizio 2015 M-Series television, using Netflix, Amazon, Vudu, and Plex as sources. At best, the advantages of 4K video border on the subconscious. It seems the closer you pay attention, the harder it is to notice any improvement. That doesn’t mean the Roku 4 and second-gen Fire TV are completely meaningless upgrades. Both are faster than the 1080p boxes that preceded them, and both support the latest 802.11ac Wi-Fi standard, which enables speedier connections over a longer range on the less-crowded 5GHz band. The Roku 4 also adds optical audio output, and has a nifty remote-finding feature that sounds a tone on the remote when you press a button on the box. But if you don’t have a 4K TV, it’s probably safe to skip these new models. The Roku 3 is a cheaper and smaller option at $100, and while Amazon no longer sells its first-generation Fire TV, owners of that model shouldn’t feel obligated to upgrade. Assuming you can discern the finer qualities in 4K video, you’ll find more to enjoy with the Roku 4. Right now, Amazon’s Fire TV only supports 4K video from Netflix and Amazon, and the company isn’t even allowing 4K playback in third-party apps. The way Fire TV handles 4K playback might be to blame. Instead of outputting in 2160p all the time, the Fire TV runs at 1080p, then switches to 2160p output when playback begins. The process feels a bit clumsy, and as AFTVNews speculates, Amazon may want to be careful about opening it up to any app. Whatever the reason, the result is a much wider 4K app lineup with the Roku 4, which always outputs in 2160p (with an upscaled 1080p interface in apps and menus). In addition to Netflix and Amazon, users can buy or rent 4K videos from Vudu, M-Go, and UltraFlix. Plex can serve up 4K videos from a networked storage device, and YouTube’s vast 4K video library is available for free. Smithsonian Earth offers subscription nature videos in 4K format, and you’ll even get higher-resolution images in the photo apps Flickr and 500px. Roku also offers a handy “4K Spotlight” app that brings some of this content to the surface. It isn’t the prettiest app around, and jumping out to separate apps just to learn the rental or purchase price of a movie is a major hassle, but at least it provides a glance at what the box can do. Roku’s 4K Spotlight app is a convenient way to find Ultra HD videos. The biggest difference between the Roku 4 and Fire TV isn’t how they approach 4K content, but their philosophies toward content in general. This becomes obvious when you look at the two devices’ home screens. The Fire TV’s home screen is a bit of a mess, with videos from Amazon scattered everywhere. You rarely feel stumped about what to watch, because so many recommendations are staring you in the face. But Amazon’s own videos do tend to overshadow content from other apps—the Fire TV’s master app list is six remote clicks away—and they become downright obnoxious if you’re not a Prime subscriber. The Fire TV makes Amazon Prime video inescapable. The Roku home screen presents an app list, and lets you handle the rest. These philosophical differences extend to the two boxes’ voice search features. When you search for something on Fire TV, it takes a guess at the app or service you wanted—usually Amazon—and makes it the featured search result. Information about availability on other streaming services is hidden behind a menu button. With Roku, searching by voice produces a list of streaming services where you can find that movie or TV show (and, unlike Fire TV, it includes Netflix). Roku’s voice search doesn’t seem as good at recognizing spoken commands, and it can’t search by genre like Fire TV can, but it’s more thorough. Fire TV search is prettier, but Roku’s results are better. 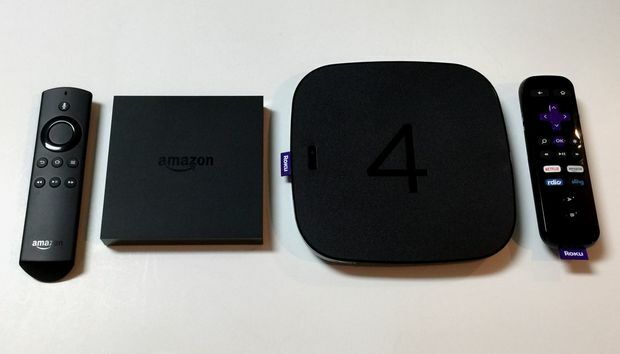 Deciding between the Roku 4 and Fire TV depends on how committed you are to the 4K format. If you believe those extra pixels matter, Roku will give you more ways to enjoy them. The Fire TV doesn’t have as much 4K content—or as deep of an app catalog in general—but it’s a better box overall for people who plan to consume a lot of Amazon Prime video. And given that 4K is built into the $99 product, you can dabble in the higher-res format without having to spend even more on hardware (those 4K TVs aren't cheap). For a deeper dive into each product, read on for our full reviews of the Roku 4 and second-generation Amazon Fire TV.